Randy Cuthbert graduated from Central Bucks West High School in 1988, where he lettered in three sports: Football, Basketball, and Track. 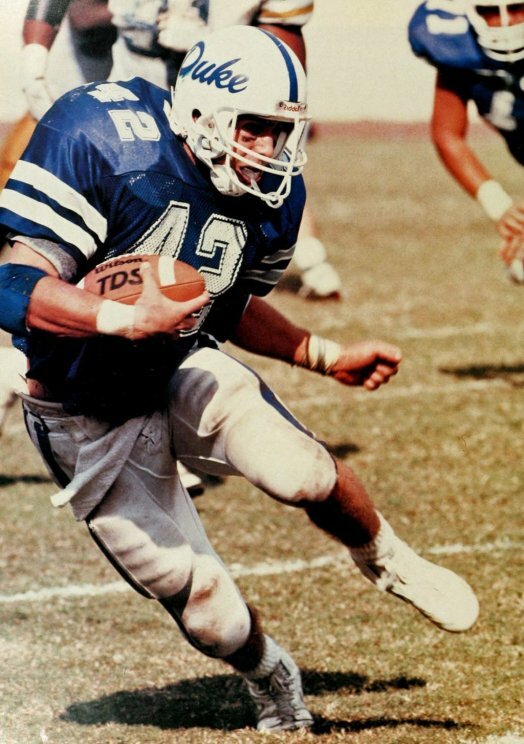 Randy was First Team All-American and All-State Football. He was the Captain of the Football and the Track teams, and was the MVP for both teams at CB West. Randy received the honor of being the Philadelphia Inquirer Back of the Year, and he was the Maxwell Club Award winner. During the years Randy played football at CB West, the team record was 33-0! After high school, Randy attended Duke University where he was a three year starter and team captain under Steve Spurrier. The holder of many school records, he posted over 4,000 all purpose yards including 2,700 + yards rushing and 1300+ yards receiving on 150 receptions. Along with this, he scored 25 touchdowns while leading Duke to the ACC championship. He was the only two time 1,000 yard rusher in Duke history. He was three times All-ACC and a two time Doak Walker nominee. He was on the All-ACC academic team and was a two time MVP. Randy won the Mike Suglia Award for being the top student athlete and won the Brian Piccolo award for being the ACC comeback player of the year. He played in the Blue-Gray game and Senior Bowl All-Star games. Randy played two seasons in the NFL for the Pittsburgh Steelers. He played one season with the Carolina Panthers before retiring with knee injuries. Randy is the current head coach for Pennridge High School.